But the globalists, Democrats, and others touting the Logan Act should be very careful what they wish for. If the act were to actually be enforced, more than a few globalists and senior members of the ruling establishment might find themselves behind bars. Figure 2: General Flynn and the Bilderberg Double Standard? 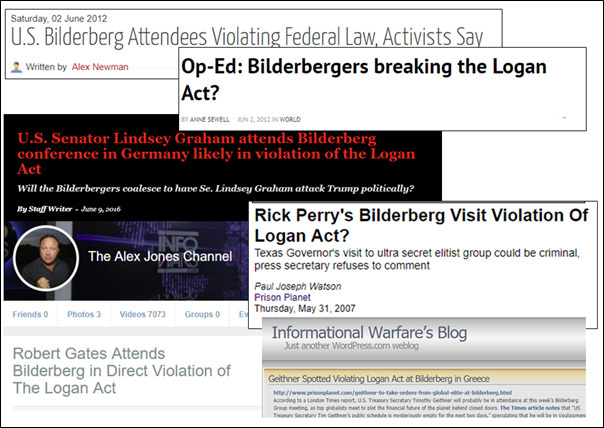 The belief of Daniels and Newman that US Bilderberg participants are violating the Logan Act is hardly new, having been raised repeatedly by alternative activists and journalists, (usually derided in polite company, as “conspiracy theorists” and “cranks”), not just in recent years (see Figure 3), but for decades. 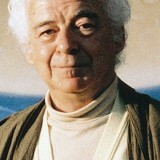 The late Jim Tucker, for example, the Bilderberg-chasing reporter for the Liberty Lobby’s publications Spotlight and American Free Press, raised this subject in his 1973 interview with Forrest Murden, an “international public‐affairs and management consultant” whose consulting firm, Murden and Company, handled “administrative duties” for the Bilderberg Group in the US (later becoming “American Friends of Bilderberg, Inc.”). Tucker had asked if the deliberations at Bilderberg “violated Logan Act prohibitions against private citizens trying to influence foreign policy”, but in his response Murden insisted these discussions were “common and legal” (Jim Tucker’s Bilderberg Diary, p.15). Most of the existing commentary on this issue argues, with varying degrees of certainty and accuracy, that American citizens participating in Bilderberg Meetings are breaching the Logan Act. “Many people believe this meeting is possibly a violation of the Logan Act…” podcaster Mark Dice wrote in his 2015 book The Bilderberg Group: Facts and Fiction (p.6). According to Daniel Estulin, in his book, The True Story of the Bilderberg Group (2007), the Logan Act makes it: “absolutely illegal for elected to officials to meet in private with influential business executives to debate and design foreign policy.” Estulin identified no less than 21 prominent Americans who have “flouted the Logan Act” (ibid, p.28). American private citizens (CEOs, bankers, think-tankers and academics, as well as some elected U.S. officials) who are with Bilderberg do fraternize, discuss issues and correspond with other Bilderberg members, some of whom are foreign officials who currently hold office with official duties and powers. Plus it’s all very hush-hush. Figure 3: Yet More American Bilderberg Participants Violating the Logan Act? Despite this seeming certainty that US participants at Bilderberg are violating the Logan Act, none of this commentary actually cites any legal opinions. More remarkable is that it also ignores advice on Bilderberg and the Logan Act provided by the US Department of Justice (DOJ) that has been on the public record since 1971. This official advice comes in the form of correspondence between the DOJ and US Congressman John R. Rarick (1924-2009), a four-term Democrat Congressman for Louisiana. A controversial figure, Rarick was an ardent segregationist, who had dismissed Martin Luther King as a “Communist errand boy”; was accused of being a patsy for the “neo-Nazi” Liberty Lobby, from which he had received $3000 in contributions in 1968; who was denounced by a fellow Democrat Congressman in 1969 for promoting a “view of the world [that] borders on the absurd…”; and then, in 1972, he was condemned by another colleague as the “leading racist in this Congress.” Given his Liberty Lobby connections and that organization’s interest in Bilderberg, it was not surprising that Rarick would take up the issue in Congress. Rarick had focused on the Bilderberg meeting, held over April 23-25, 1971 in Woodstock, Vermont. 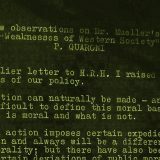 On May 5, 1971, Rarick told Congress about the “top secret” meeting of “nobility, international bankers and international bureaucrats…” He considered it “strange” that the “real masterminds of the international movement, including custodians of great wealth”, could hold “secret meetings in New England without one wire service or TV network carrying this story.” The Bilderbergers, he suggested, were not interested in “saving” America, but were “plotting its destruction” (Congressional Record, Vol. 117, Part 10, pp.13688-89). Speaking again on May 10, Rarick floated the theory the Bilderbergers meeting at Woodstock “may just have masterminded the assault on the stability of the U.S. dollar” (Congressional Record, Vol. 117, Part 11, p.14189). So, it seems plausible that one or more of the U.S. citizens present at the recent secret Bilderberg meeting could very well have committed a criminal offense under the Logan Act. Could this be the reason for the veiled secrecy? (Congressional Record, Vol.117, Part 13, p.16698; emphasis added). Nearly seven weeks later on July 16 Rarick returned to the House of Representatives with an update. 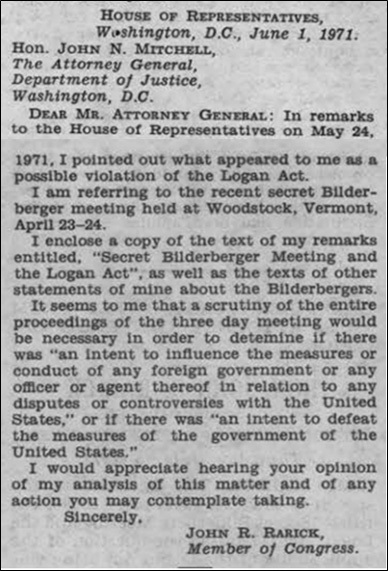 He noted he had written to the Department of Justice on 1 June (see Figure 4), enclosing a copy of his May 24 speech, seeking their “opinion of the Bilderberg meeting and whether it constituted a possible violation of Logan Act.” He also asked “what action was contemplated by the Attorney General.” In the letter itself Rarick suggested that “scrutiny of the entire proceedings of the three-day meeting would be necessary…” to determine if there had been any “intent” by the US Bilderberg participants to interfere with US foreign policy. Figure 4: Rep. John Rarick’s letter to the US Attorney General (as reproduced in the Congressional Record). However, you also pointed out all the details of the discussions, conclusions and recommendations reached have been suppressed from the public and one can only speculate as to what transpired. The Department had no coverage of this meeting and we have no information which would justify requesting the Federal Bureau of Investigation to conduct a criminal investigation of the activities of presumably innocent citizens [emphasis added]. In a final flourish, the DOJ held out the possibility of an investigation, but only when it had received “a specific allegation or specific information indicating a violation of the Logan Act.” Rarick was incensed by this, arguing that “Many Americans” would be “shocked” to learn that if they expect “any action” from the DOJ on this matter, it would be up to the citizens “to infiltrate the secret meetings and supply the data providing specific allegations or specific information indicating a violation of the Logan Act” (Congressional Record, Vol. 117, Part 19, pp.25649-50). The Rarick-DOJ correspondence has been publicly available in the Congressional Record for nearly 46 years, yet most Bilderberg critics seem to be unaware of it. This is odd as its existence has hardly been kept a secret. Rarick’s main contribution to Bilderberg lore, putting into the Congressional Record (Vol.117, Part 24) on September 15, 1971 Eugene Pasymowski and Carl Gilbert’s lengthy article “Bilderberg: The Cold War Internationale”, cites his previous Bilderberg entries, including “Bilderberg Case: Reply from U.S. Attorney General’s Office” (Figure 6). This piece, which is available on the internet, has been cited in numerous books, both academic and conspiratorial, for years. Yet the fact Rarick received advice from the DOJ on the Bilderberg and the Logan Act has been ignored. Mark Dice in The Bilderberg Group: Facts & Fiction, for example, quoted from Rarick’s introduction to the Pasymowski and Gilbert paper—erroneously presented by Dice as a “ten-page statement” that Rarick himself had “typed up” (p.45)—but he skipped over Rarick’s citation of his correspondence with the DOJ on Bilderberg and the Logan Act. Hemel and Posner focus on two examples: in 1961 a group led by former First Lady Eleanor Roosevelt tried to negotiate the release of prisoners held by Cuba after the failed Bay of Pigs invasion; and in 1975 Senators George McGovern and John Sparkman also initiated contacts with the Cuban government. In each case, accusations were made that they had violated the Logan Act, but the US Government disputed this acknowledging the visits occurred with the full knowledge and implicit assent of the administration at the time. 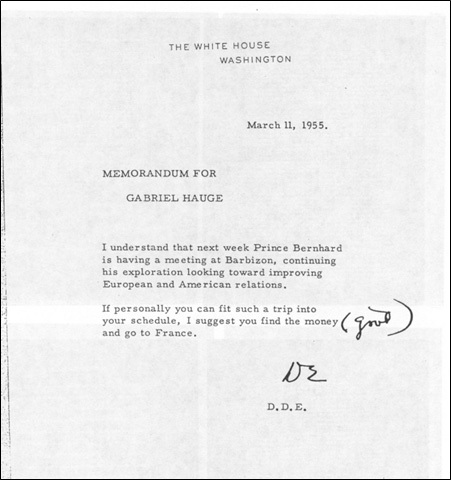 In March 1955, President Eisenhower directed his Assistant to the President for Economic Affairs, Gabriel Hauge, to attend the second Bilderberg meeting, then due to be held in Barbizon, France (Figure 7). 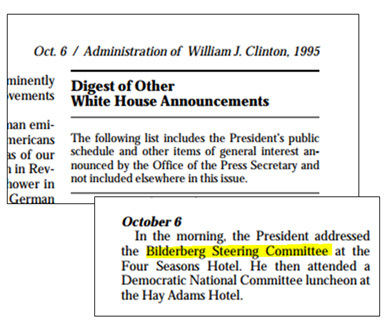 President Bill Clinton, who had attended the 1991 Bilderberg meeting in Baden-Baden, Germany, addressed a meeting of the Bilderberg Steering Committee on October 6, 1995 (Figure 9); then in 1997 First Lady Hillary Clinton had made a clandestine visit to that year’s Bilderberg Meeting on Pine Island, Georgia. Another form of implicit authorization can be seen in the correspondence between senior US officials and civilian participants about upcoming meetings. For a classic example there are the telephone conversations between David Rockefeller and Henry Kissinger, whilst the latter was working for President Nixon. 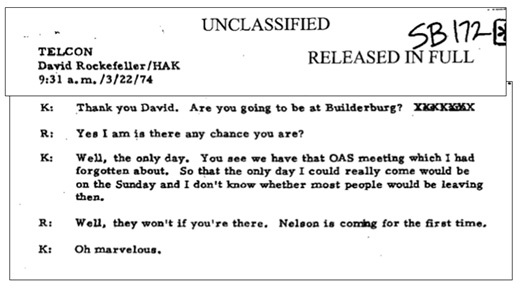 In one exchange from early 1974 (Figure 10), Kissinger casually asks if Rockefeller, a private citizen, is going to that year’s Bilderberg meeting. 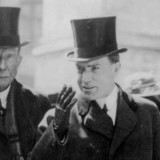 Rockefeller confirms this and later adds that his brother Nelson was due to attend his first such conclave. Both Rockefeller and Kissinger appear to operate from the assumption that there is nothing remotely illegal or troubling about Rockefeller’s participation in Bilderberg. And as Secretary of State at that time, Kissinger was arguably providing implicit assent to such participation on behalf of the Nixon Administration. By Hemel and Posner’s criteria each of these instances, where high-level US Government political leaders and officials patronised Bilderberg, amounted to implicit authorization for US citizens to participate in the Bilderberg Meetings. To note: the US Government was aware of the meetings, Bilderberg’s purpose and who was participating, and thus acquiesced to the presence of US citizens at Bilderberg and meeting with foreign officials. Bilderberg & Diplomacy: The second issue concerns what actually happens at Bilderberg. The Logan Act specifically proscribes actions that interfere with US diplomacy, particularly attempts to influence a foreign government’s relationship with the US. 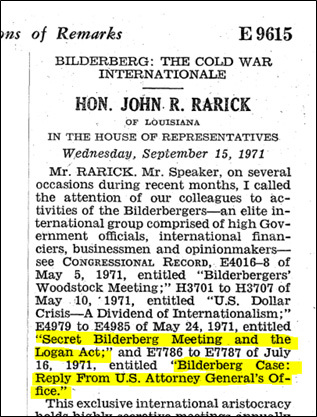 In his Congressional critiques Rarick entertains the view that Bilderberg has a conspiratorial purpose; that at Woodstock its members were “planning change in the American role in the world…” and it was somehow responsible for an attack on the US currency. The DOJ, in contrast, offered no particular theory on what Bilderberg actually did, merely the excuse it had “no coverage” of Bilderberg and therefore “no information” that would justify an investigation. Indeed, the DOJ response seemed to reveal complete ignorance of the Bilderberg Group. Bilderberg’s political role is contentious. In both its official propaganda and in its instructions to participants Bilderberg insists its meetings “do not formulate policies or reach conclusions and no resolutions are submitted for discussion or vote…” However, Bilderberg internal documents confirm that it aspires to perform a shaping and influencing role. In the official minutes of the third Bilderberg meeting (Barbizon, 1955), for example, participants were encouraged to “put forward ideas and suggestions made at Bilderberg…” at the various other meetings and conferences they might attend, and that “particular use would be made of the press by all concerned for this purpose.” Bilderberg co-founder Joseph Retinger argued that Bilderberg was not a “policy-making body”, instead its aim was to “draw the attention of existing organizations to the points in question; what those organizations do remains their own responsibility” (The Bilderberg Group, August 1956, p.5). Likewise, former NATO Secretary General and Belgian Minister for Foreign Affairs Willy Claes, interviewed on Belgian radio in 2010, explained that Bilderberg participants are expected to “consider using the [Bilderberg] report in setting policies in their own environments…” (emphasis added). In short, Bilderberg’s primary aim is to influence foreign and domestic policies of the North American and European countries represented at Bilderberg. This is not achieved through a process of formal, though secret, sinister negotiations, as Rarick believed, but through the precisely choreographed and rather benign format of people delivering papers that participants then discuss. Bilderberg’s expectation, as articulated by Retinger, Rockefeller and Claes, is that participants will take the ideas promoted and debated during each session back to their own countries to seed these great thoughts into the elite and public spheres. Participants are therefore selected based on their reputation as an influencer in their own country. Bilderberg is thus geared more towards consensus-building than diplomatic negotiation, but its ability to change policy should not be underestimated. Bilderberg’s role in the push to change US policy towards Communist China, for example, highlights the subtle ways that its processes have changed US foreign policy. The issue of influence is important because the Logan Act proscribes actions with “intent to influence the measures or conduct…” of any foreign government or its representatives or to “defeat the measures of the United States.” According to Hemel and Posner, there a number of circumstances where US citizens can converse with representatives of a foreign government without attracting the ire of federal prosecutors. This includes instances where the intent is to “influence American public opinion or the American government” rather than a foreign regime. In the case of Bilderberg, as we have seen, the main aim is for participants to come back with ideas to influence their own countries – so for US participants the target of influence is American public opinion and government. Of course, diplomacy still occurs at Bilderberg meetings with the involvement of American participants, but there is no evidence this has occurred in violation of the Logan Act. There are a number of reasons for this. First, in the few examples known, all such diplomatic activity involving the US has been conducted by US officials. Henry Kissinger, for example, made arrangements to meet with his West German counterpart, Egon Bahr, on the sidelines of the 1971 Bilderberg Meeting in Woodstock (Kissinger, The White House Years, p.828). Second, despite the insistence of the Bilderberg Steering Committee that all invitees participate in a private rather than an official capacity, most officials turn up with talking points developed by their respective department or ministries to present both during the main sessions and for talks with their counterparts on the sidelines. 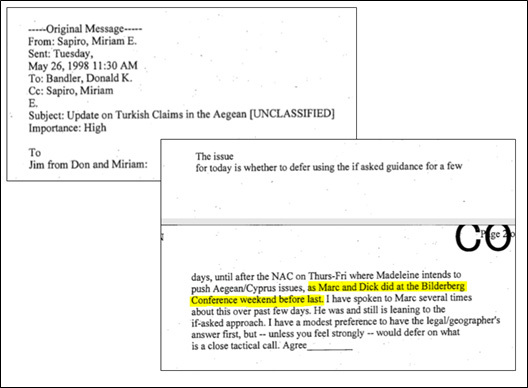 For example, in 1998 it was noted by National Security Council staff (Figure 11) that US Special Envoy to the Balkans, Richard Holbrooke and the Assistant Secretary of State for European Affairs, Marc Grossman, had decided against using “if asked” talking points regarding Turkish claims to Greek-inhabited islands in the Aegean while at that year’s Bilderberg meeting. Again, while US private citizens at Bilderberg may have participated in discussions aimed at influencing the foreign and domestic policies of the US and other countries represented, there is no evidence as such that they have directly interfered in official US negotiations. But even if they had, that is unlikely to be considered a violation of the Logan Act given the implicit authorization of the US Government for American citizens to be at Bilderberg in the company of foreign officials and the fact that US officials are usually also present at the meeting (although under Obama administration officials missed three Bilderberg meetings). Bilderberg Secrecy: The final issue is the primary bugbear of all anti-Bilderberg activists: its pervasive secrecy. In making his argument that Bilderberg probably violated the Logan Act, Rarick made much of Bilderberg’s “secrecy”; he repeatedly described it as a “top secret” or “secret meeting”; its “secret discussions”, that were “suppressed from the public…” Rarick also speculated that Bilderberg’s secrecy was intended to protect US participants from exposure, should they be breaking the Logan Act. The DOJ was of course less helpful, seeming to troll Rarick by using his claims that news about Bilderberg was “suppressed” from the public as a valid excuse for not pursuing the matter any further. The DOJ also made the misleading and implausible claim it had “no coverage of this meeting…” and “no information” about any offenses having being committed. Rarick’s notion that Bilderberg is off-the-record to protect its American participants from being exposed to prosecution under the terms of the Logan Act is remarkable, but no documents have emerged to support it. Research by academic Thomas Gijswijt notes that the push for the meeting to be private and not-for-attribution was driven largely by the belief discussions would be more productive under these conditions. [**] “People speak more freely if they know they’re not being quoted. That’s the only reason”, Bilderberg Chairman Prince Bernhard told the media ahead of the Woodstock meeting (Nashua Telegraph, Apr. 23, 1971). Bilderberg’s non-attribution policy, borrowing from the Royal Institute for International Affairs “Chatham House Rules”, is to ensure all participants can speak without fear of being quoted in the media, rather than to avoid legal pressure. The DOJ response, in contrast, was somewhat disingenuous. While the DOJ itself had no representation at the 1971 Bilderberg meeting other parts of the US Government were represented at the meeting in question. To resolve its “coverage” problem the DOJ could have sought comment from Nixon’s National Security Advisor, Dr Henry Kissinger who was not only a participant at the Woodstock meeting (where he appeared to have spoken at length in response to one of the papers), but had also attended three Bilderberg meetings prior to joining the Nixon Administration and was close to two of Bilderberg’s key members, David Rockefeller and Bilderberg’s Honorary European Chairman Ernst van der Beugel. Gen. John Vogt…said the delegates hoped to help determine the role of business during times of social unrest, in addition to possibly redefining this nation’s role in international affairs (Bennington Banner, Apr. 26, 1971). Quite simply, had the DOJ wanted to, it could have easily sought information about the Woodstock meeting from the high-level US Government participants, that would have included whether any US citizens had potentially violated the Logan Act. Likewise Rarick could also have asked five of his fellow US Congressman—Senator Adlai Stevenson III, Rep. Henry Reuss, Rep. Donald Regle, Rep. Donald Fraser and Rep. Peter Frelinghuysen—if they had any concerns about the conduct of US citizens at the Woodstock meeting or if the Nixon Administration had warned them against attending because of the Logan Act. It would seem that neither party pursued these options. 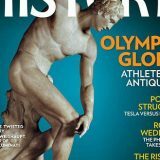 [Jeff] Bezos met with foreign leaders to talk about foreign affairs, so if [the Washington Post] wants to start accusing people of violating the Logan Act, it should start with its owner. But, as Rarick’s experience shows, there is little chance of such concerns being taken seriously even with a sympathetic administration in place. Nixon never attended a Bilderberg meeting, and was given to rants about the Rockefellers and the “Eastern Liberal Establishment”, and twice threatened to revoke the security clearances for the Council on Foreign Relations. Yet in 1971 the Department of Justice, led by Nixon appointees, gave Rarick a smug and superficial response to his queries that put the onus back on him to find the evidence to justify an investigation. To be sure the DOJ treated Rarick’s letter about Bilderberg and Logan Act as serious enough to warrant a response—because the author was a Congressman—but not, it seems, a serious response. Also at issue, and largely overlooked or possibly concealed by the DOJ response, is evidence that since the 1950s successive US Governments have given either explicit or implicit authorization for US citizens to participate at Bilderberg. This effectively puts all US attendees beyond the reach of the Logan Act. This fact alone should give pause to activists looking to the Logan Act to crack down on US Bilderbergers. Anti-Bilderberg activists might also note this apparently long-standing policy has been endorsed by the Trump Administration, which dispatched four officials to the 2017 Bilderberg meeting (including Commerce Secretary Wilbur Ross) and made no moves to censure US civilian participation at Bilderberg. Of course, attacking Bilderberg would have put Trump at odds with some of his key supporters including Bilderberg Steering Committee member Peter Thiel and former critic but now “one of his best friends”, South Carolina Senator Lindsey Graham; and frequent foreign policy confidante Henry Kissinger. But it would seem that the plutocrat who ran as an enemy of the “globalists” and promised to upend the establishment platform is intent on leaving yet another piece in place. [*] Quoted in Thomas Gijswijt, Uniting the West: The Bilderberg Group, The Cold War and European Integration, 1952-1966, University of Heidelberg, (2007), p.25. 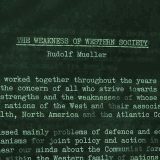 [†] Hugh Wilford, “CIA Plot, Socialist Conspiracy, or New World Order? The Origins of the Bilderberg Group, 1952-55”, Diplomacy & Statecraft (September 2003), p.73. 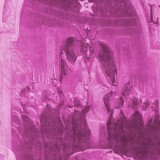 [‡] Gijswijt, Uniting the West, pp.37-38. 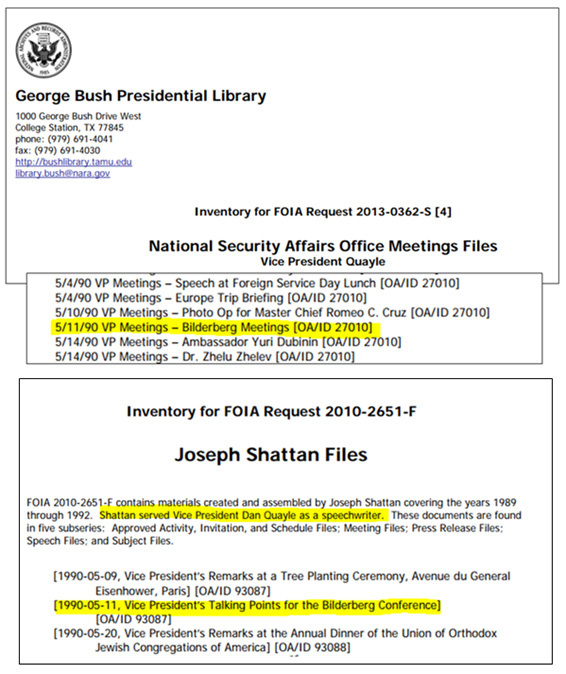 [§] Sununu and Wolfowitz are listed as participants in the official minutes of the meeting (Bilderberg Meetings, Glen Cove Conference, 10-13 May 1990, pp.10-11); but Quayle is not. Prior to the publication of the official documents cited in Figure 8, Quayle’s participation at the Glen Cove meeting had been mentioned in Walter Isaacson’s 1992 book Kissinger: A Biography (p.756); and a report in the Washington Post (Jan. 12, 1992) citing the opinions of David Rockefeller and William T. Esrey, Chairman of US Sprint and United Telecommunications, who both thought Quayle’s presentation at Bilderberg had been so “stiff and scripted” he “should not have been sent” to represent the Bush Administration. [**] Gijswijt, Uniting the West, p.32. State department video proves Flynn most certainly was given permission and even support to have meetings with transition team. It is clearly on video with a state leader saying Obama and them expected and encouraged him to do so. Obama, and others, however leaving office did NOT have such permission. Three points to make about this: (1) there’s no evidence that Flynn has been charged for violating the Logan Act, he’s mainly in trouble for lying to the FBI about asking Russia not to retaliate against Obama’s sanctions, asking a number of countries to vote against a UN resolution condemning Israeli settlements and misrepresenting the extent of his consultancy work for the Turkish Government; (2) permission to talk, doesn’t mean permission to undermine the outgoing administration’s foreign policy by appealing to another country to vote against it, but again Flynn didn’t get into trouble for that; and (3) the outgoing administration is still the legally constituted government until the new president is sworn in, so it still has the actual authority to make foreign policy and manage international relations. During the transition period the president-elect and incoming officials (not sworn in at that stage) are expected to make contact with foreign counterparts, but not to actively undermine the government of the day’s policies by telling other countries how to react before they have even assumed office.